30 Second Wine Advisor: Wine or vuvuzela? Vibrant Rioja is giving you the chance to win the experience of a lifetime - a trip to Rioja, Spain - and all you have to do is join the Vibrant Rioja Community. If you're one of the millions of Americans who've finally learned to get almost as excited as just about everyone else on Earth about the quadrennial World Cup, I guess you'll be perched like me in front of the television on Sunday when the vuvuzelas start buzzing as Spain and The Netherlands meet in the final. With the games timed for tasteful weekend afternoon wine sipping in the Americas or an early brunch in Europe, it will be entirely appropriate to tune your beverage du jour to the team of your choice: Rioja or another Tempranillo-based red, perhaps, or a crisp, chilled white Albariño if Spain's your team; maybe a brace of cold Heinekens or a tall gin fizz if you follow the Dutch. I have an alternative suggestion, however. Why not choose this occasion to pay homage to South Africa, the first-ever African host of the month-long games? Don't worry about some of the chilly, rainy games we've been watching. It's winter down there right now. In spring, summer and fall, though, South Africa's coastal exposure and climate provide an ideal environment for wine grape cultivation. South Africa has been making - and drinking - its own wine for 350 years, since Jan van Riebeeck, the first governor of the Cape, uncorked a bottle of the first wine ever made there on Feb. 2, 1659. (For a neatly organized, detailed overview of South African wine and its history, including facts like this, click your way over to the regional wine sales and information Website, South African Wine.co.za. Today's tasting, Edgebaston 2008 "The Pepper Pot," a red blend from Stellenbosch (featured below), would make a fine accompaniment for Sunday's match. Its pleasant mix of berries, black pepper and spice in a hefty but balanced table wine is easy to enjoy. It might be a better symbol for South African hospitality than, say, a vuvuzela. How would you like to discover the land of a thousand wines? How about uncovering the heart and soul of one of the world's greatest wine regions? Vibrant Rioja is giving you the chance to win the experience of a lifetime - a trip to Rioja, Spain - and all you have to do is join the Vibrant Rioja Community. Oh! and you'll receive our newsletters, which will keep you informed of our tastings, events, delicious recipes, tasting notes and much, much more! Just click here to get started. In the meantime, visit Vibrant Rioja! FOOD MATCH: A peppery, spicy red, as the name implies, its rustic style makes it a natural with hearty stews, spicy sausages, burgers, ham and meaty picnic fare. VALUE: An excellent value from $10 to the lower teens in many markets. WEB LINKS: The U.S. importer's current home page features a fun cartoon video about World Cup as well as video interviews with Edgebaston's wine maker David Finlayson. 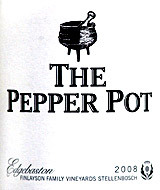 Find vendors and compare prices for Edgebaston "The Pepper Pot" on Wine-Searcher.com. For U.S. distributors by state, check this link on the importer's Website.